You have encountered one of the many difficulties with packaging chocolates, the vastly differing sizes and shapes of molds. Many producers stick to one type and size of mold (such as half-spheres or domes), so they eliminate this issue. I have a large variety of molds, including the cacao pod you list, as well as the "quenelle" and recently a small half-egg. I have been using stock trays to hold them, but the cavities in those trays were too small to accommodate my larger molds (such as the Chocolate World pyramid) and too large for the others I listed. Finally I couldn't stand the issue any longer and had custom trays made. The cavities are 1.5" x 1.5", and so every shape I make now fits. The cacao pods and the eggs have to go in diagonally, but they fit. Essentially, except for things like wedding favors, I have stopped using the very small molds (such as the Chocolate World magnetic cube, which I like very much, but which just "bounces around" in a typical cavity). Stock trays seem to have cavities in two sizes: something like 1" or something closer to 1.75" (often labeled for turtles or nut clusters), and most chocolatiers appear to go for the smaller size. Another option is to use foil/paper cups to hold the chocolates plus boxes into which they fit. 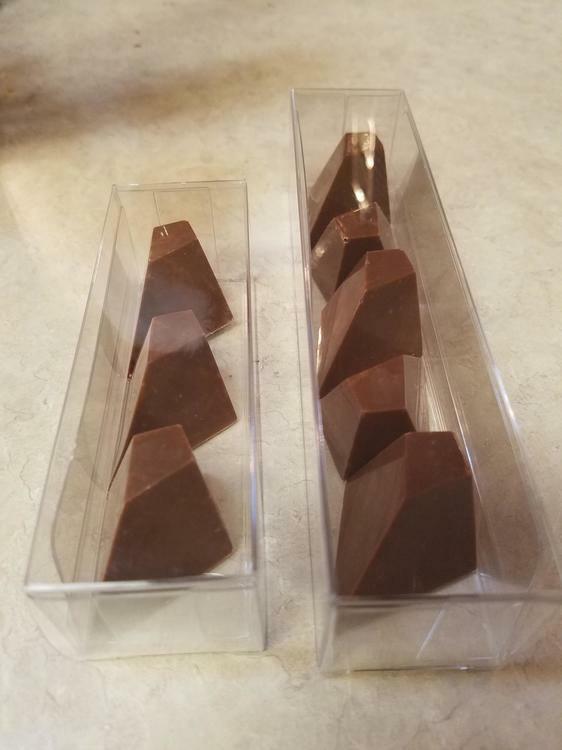 This option is more flexible, but then there is the issue of making certain chocolate shapes fit into the cups (such as the pyramid mentioned above). And again, cups are made only in certain sizes (the #4 and #5 are the most prevalent). My custom trays were made by FormTight in Denver. Why so far away from Virginia? Because, after extensive searching and inquiring, this was the only company I would find that would manufacture "small" quantities (quotes because I still had to buy more than I will ever use). They were very, very expensive (it's the tooling that will kill you). I count it as a splurge for the sake of the chocolates. Candy cups come in a number of sizes. Do you know what size you tried? You should be able to find one that will fit appropriately to secure the pieces and keep them from moving around.